Three “Middle Eastern” men (hint: they worship allah) in two different cars were caught trying to sneak into Camp Pendleton. And, even though two of them in one car said they didn’t know the third guy in the other car, all three of them used the same excuse, down to the details of why they ventured into the Camp and where they were actually going. And they tried to get on the base three times using phony stories. Also, one of the cars was mysteriously tampered with in a way that a bomb could be stored there–undetected–in the future. But, hey, I’m sure it isn’t a dry run. Oh, and don’t let the “ian” endings on the surnames of two of the men fool you. Not all people with “ian” at the ends of their names are Armenian. Some are Iranian Muslims, as in this case. All three were clearly testing and probing for some malefactor with scary plans for the servicemen at Camp Pendleton. A security alert was reportedly issued at Camp Pendleton after three Middle-Eastern men in two vehicles drove onto the base under suspicious circumstances Saturday night around midnight. The drivers said they didn’t know each other, but both said they were lost and trying to get to Glendale. One of the drivers reportedly ignored orders to wait at the main gate and drove onto the base. A search turned up no weapons. But an airbag had been pulled out and reattached with duct tape and wires were hanging free. The next morning the other driver returned to the base and said he made a mistake and was trying to get onto Interstate 5. A background check showed that the men all had clean records. Three men — 40-year-old Afghani Ahmad Rahmani Naeem, 41-year-old Iranian Vahik Petrossian and 27-year-old Iranian Sengekdi Norvik Avanosian — attempted to get into Camp Pendleton last weekend under what was considered suspicious circumstances. . . . Since the incident, 10News learned high-ranking Camp Pendleton officials have notified other military bases and law enforcement of a potential threat. . . .
Amanda Sumner, who lives on the base, said the alert was very concerning for her. “My family lives there and I know it’s very easy access to get on base at the front gate… All you have to have is a driver’s license that isn’t suspended,” she said. Absurd. By the way, reports claim all three of these men are here legally. Why? Why wasn’t this enough to hold them indefinitely until we learned what they were up to? 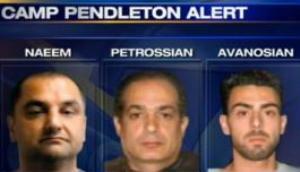 Do we really believe these men had anything other than diabolical plans for the occupants of Camp Pendleton? If you’ve ever tried to get onto a military base, it’s virtually impossible to do “accidentally.” Hopefully the guards at our bases will be extra-vigilant. Sure sounds like a dry run to me. Like the idiots who cause a ruckus on an airplane and then act like “What’s the big deal???? ?’ “You’re racially profiling me!! !” when someone plays attention. Had they been average White Guys they would have been helod indefinitely until further notice. You know Debbie, I live near there and the local Union Tribune did not report it. Way to go Marines keep up the good work. It makes sense to profile these people. I know the roads in the area very well. No one could honestly make the mistake these jihadis made, and the area is a long way from Glendale, anyhow. These guys are idiots, but potentially dangerous idiots. Jake, the reason why the “Union Tribune” didn’t report in their failing newspaper rag is because the perps are middle eastern lineage and more likely “muslims”, that’s why. Jake, this is one of the reasons why the newspapers in this country are failing and going bankrupt, because they continue to cover up and sweep up all of the important details under rug and want we the people to dummy-up and not know what’s happening. I entered a Marine Corp air base tears ago. My friend was working at the Marine Corp Air Station at Tustin, CA, and had to meet me at the gate. He warned me that the MP guards were bad news, and not to mess with them (not that I would have, anyway). I cannot imagine anyone getting a US Marine base with just a driver’s license. I wonder how long it will be before the ACLU files a lawsuit against the Marines for mistreating these wayward gentlemen and for their illegal racial profiling techniques that prevented these fine muslim men access to Camp Pendleton. I work near Ft. Jackson, teach many of the kids from the base. I’m told that if you attempt to get on base without clearance, they’ll arrest you and tow your car. Why didn’t they do this with these guys? Debbie please, for a former Marine correct your calling of Camp Pendleton a “Fort”. The army has forts, the Marines have Camps. Such as Camp Pendleton, Camp Lejuene, Camp Geiger, Camp Johnson (where the Beirut Memorial is)Camp Hanson and the remote but fun and exciting Camp Schwab. Its obviously a dry run. I know that area of San Diego well because I’ve been past it. Their explanation that they got lost is hardly believable. The lack of criminal record means nothing. Al Qaeda sleeper agents had them, too. Those guys were up to no good. If strange men show up at a military base for no apparent reason, assume they aren’t there for the sight-seeing. They were looking for weaknesses in our base security. Whoever they work for learned more than they needed to know. @nomadic: you are 100% correct. not only is glendale not in proximity to camp pendleton, it’s two counties over. glendale=los angeles county, next is orange county, then san diego county=camp pendleton. they all should have been arrested, interrogated, possible lie detector tests. and if they flunked the interrogation, last i heard guantanamo bay is still open for business. the gentlemen in the 2nd car should have been fired on immediately after they disobeyed orders to stop- if not targeting the glendale seekers directly with intent to kill at a bare minimum the car should have been immediately disabled in a hail of gunfire. the lack of security is appalling, shocking, and downright unacceptable. DrDream, actually. If they drove a truck loaded with TNT through the base, there could have been a massacre. It just needs to happen once. Of course that’s if the Marine brass are really paying attention but then again the Army ignored Malik Nidal Hasan until it was too late to stop him. I just can not believe that these 3 up to no good stooges were released! Just unbelievable. That makes absolutely no logical sense. I find that just as worrisome and disturbing as the dry run these three men were attempting access for. And yes, Debbie, why are they here in the US anyway. Scary. THESE THREE MAKE THE REAL THREE STOOGES – LARRY, MOE, & CURLY – LOOK LIKE GENIUSES! As to the original question……I can guess not only the religion of these three, but also their nationality. They are, obviously, SWEDISH LUTHERANS!……did I pass the test to work for the TSA? BTW….I live near Ft. Hood and go there on occasion with donations to the Wounded Warriors. Believe me, I cannot just go on the post and drive around for fun. I have to be met by my military contact, etc. “Iranian Vahik Petrossian & 27-year-old Iranian Sengekdi Norvik Avanosian”……??? I am sad and disgusted that these three were not held in the brig until more info on them was available. When I was in the Marines, I had to get into Camp Pendleton and my DOD vehicle sticker had just expired (I was on a 8 month deployment). I got the third degree from the front gate and was escorted to the main office to get a temporary pass. Overall I was in uniform and showed my military ID and I still was thoroughly looked into. Something that normally take 10 minutes, took me an hour. At first I was PO’d but after looking at the whole picture, I felt better than the MP’s were on the ball. I think the MP’s should kept them overnight and probably have NIS (Naval Investigative Services) do a through background and see where they live, they have extended family, etc. I just think if these 3 got the treatment I received, CAIR and the other usual suspects would be saying “they are being harassed for being Muslim”. “As it was being searched, Petrossian and Avanosian drove up in a black Mercedes, but were told to wait. Instead, they continued past the gate and onto the base. Following a short pursuit, the Mercedes was stopped and searched”. Right there the guns drawn and ablazing! There tires would have been shot right under at the very least! Again, it seems that the Pentagon and their “can’t we get along” mentality might have to do with this slap on the wrist treatment. I hope the base commander and CO of the MP battalion have a serious review on this matter! When they say “their records were clean” that means there were no active warrants of arrest in the system, it doesn’t mean they were angelic. They could still have previous arrests and/or criminal pasts. I recently read where DOD wants to do away with base stickers for military personnel, due to budgetary constraints. There is definitely more to this than meets the eye. and ice or border patrol was not called to question the 3 rag heads because???? laffing..BP operates a permanent checkpoint about 8-miles to the North of the main gate in San Clemente. Behind the station there is even a seldom used road where BP could be at the main gate in 15-minutes tops. But we don’t enforce immigration law anymore silly! Last week President Obama said he wants all illegal aliens in this country to “succeed”. Cute, huh? 1. What are they doing in this country in the first place? 2. How come they are not still in the brig? 3. Why can’t we deport them back to the “Islamic Paradise” of their choice?